What pregnancy really means to me..
As I lay here feeling like a beached whale in my 38th week, here are some of my (sometimes superficial) musings. I have no energy which in turn makes me feel like a rubbish mother to my 3 year old. She doesn't get that mummy can't run up and down without pee'ing myself or feeling like labour may start any minute. I can't wait to have a runny egg, lashings of smoked salmon and loads of pate. Right now I am sh*t scared of labour, I'd like to cross my legs and hide in a cupboard until it's all over. I really want this baby out! I know, when matched with the statement above it shows how mixed up this sherzaz really is. I want to be able to sleep whatever way I like without waking myself up as I do a 55 point turn just to bloody move half an inch. 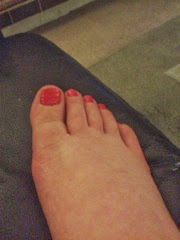 On that note please can I have my feet back and not these inflated party sausages. As for my hands...carpal tunnel syndrome - I hate you and your painfulness. My wedding and engagement ring better fit once this is over and my hands return to their normal slim selves, not like the (a bit too bubbly) assistant in the jewellers mused that 'they may stay that way'. Thanks love!! I guess it might mean more diamonds in the long run if they don't fit. I'm not sure how I'll cope with severe lack of sleep and a toddler whose mission seems to be to try and break me when I least expect it. I'd love my hubby to experience childbirth the way a woman does. It's great he's supportive but it's hard to agree 'we are in this together'. He got the fun part of creating this new life. My toddler treats my additional girth as an extra climbing frame. Hubby said I look 'skinny from behind'. So I heard "fat in the front". 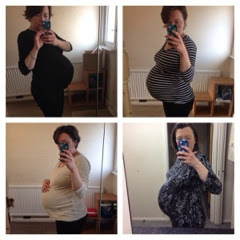 People: please stop telling me how huge I look because I was thinking I look slimmer than the last pregnancy where I was described as having 'a bit more padding'. I wish my MIL hadn't told me that she was 'never that large' in pregnancy and on at least two occasions commented that I'm going to have a large baby. I'm not (I hope) because I don't measure large! I'm going to miss taking 'bumpies'. I literally take loads! Did I mention I'm scared of child birth and the pain? Oh I did...now where's that bunker I can hide in?!? It aggrieves me that I cannot get my plate near enough to my body at meal times. I drop at least part of each meal down my bump...it's as if I don't know where my mouth is anymore. My baby moving is very comforting but also hugely painful now! I'm bored of getting myself stuck on the sofa, dropping things and being unable to pick them back up in a dignified way. These crazy hormones can do one...I am on my last nerve and anyone can get on it! I'm tired of being in control...of the toddler, my hormones, dinnertime and what to put in a hospital bag...amongst other things. "Everything is already in place this time. The track is all there, so just opens up again whereas first time around your body wonders what the hell is going on." I'm going to miss rubbing my bump and feeling like I'm actually doing something worthwhile. I made hubby go out and buy me BBQ sauce this week. I hate bbq sauce! But yet here I am, slathering it on every meal like there is no tomorrow. That's how mixed up this all is. I love that the toddler thinks a snail is coming out rather than a crying baby. She wants a pet snail at the moment. I feel selfish for thinking about half the things above. I want to be all 'zen' and loved up with this experience but it's difficult. I'm more sure than ever that this will be my last pregnancy. Which leaves me feeling relieved but already sad!! !